We’re proud to be Arizona’s number one locally owned brewery and thrilled to celebrate nine years of business with a pint of our locally brewed Oktoberfest beer. Our efforts are a labor of love and we’re so thankful for everyone that has supported us and this brew over the years,” said Anthony Canecchia, founder and brewmaster, SanTan Brewing Company. Open since 2007 under the leadership of founder and brewmaster, Anthony Canecchia, SanTan Brewing Company has established a strong reputation as one of Arizona’s favorite craft breweries. In addition to brewing, SanTan features a friendly neighborhood brewpub in Downtown Chandler, which has quickly become one of the top local food and beer destinations in the Phoenix metro area. In 2009, SanTan Brewing began distributing their Southwestern Style Ales throughout the state of Arizona, operating with a mission to pair craft beer with craft food that would inspire great conversation and good times. 2014 marked the beginning of taking this journey throughout the Southwest and California. Today, SanTan distributes in Arizona, California, New Mexico and Texas. 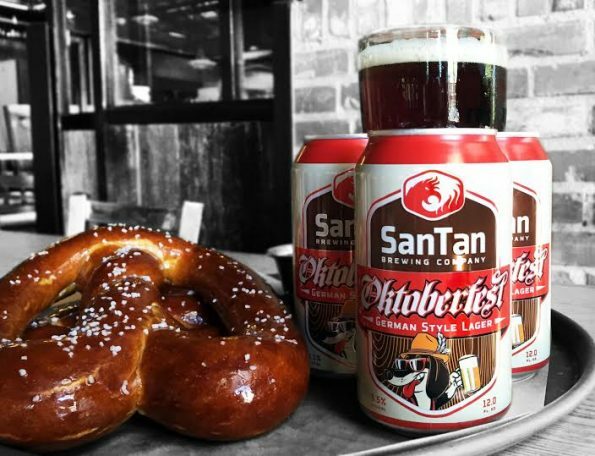 SanTan beers have won numerous national and statewide awards including a silver award at the World Beer Cup in 2016, two medals at the US Open Beer Championship: bronze in 2013 and gold in 2011. SanTan Brewing also took home a silver medal at the 2011 Great American Beer Festival.